Ceaser’s Palace at Bake Lakes & The Cat and Carp Lake at Milemead Some bad weather heading our way; Happy days! One day I am reporting great catches from Chesil, then the next day, it seems like someone flicked a switched and the fishing just turned off. What’s happening? I fished at West Bexington yesterday, in conditions that seemed pretty favourable on the surface. A steady SE wind creating a small bit of surf with clear water. Recent reports suggested that bait fish and Mackerel were in abundance, yet I really struggled, as did everyone around me. I had a message from Tom Jones, telling m he fished Ferrybridge area on Thursday night. 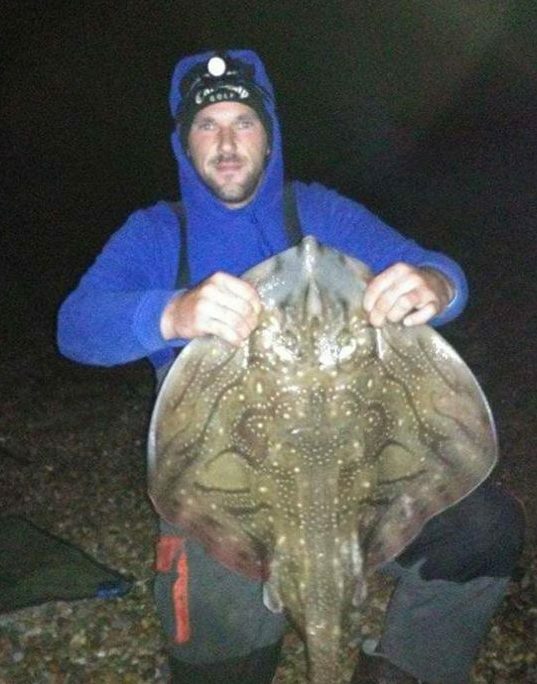 He had several small COnger and plenty of Pout during darkness, and he topped it off with a lovely Undulate Ray. However fishing during the day on Friday was really tough, with only a few small Bream. Personally I think just catching the Undulate would have been good enough for me. Well I have a theory that might explain what’s going on. Firstly, we are coming off the back of a set of very small neap tides. When ever I am asked what state of tide is best to fish Chesil, I tell anglers it doesn’t matter, as long as there is tidal flow. On the very small tides, you don’t get much tidal flow at all. It means that the bait fish are not as effected by the tide, so they don’t get forced into small areas, where they are easily picked off. It also means that the food that is normally washed to fish holding areas, or disturbed by the tide is not there. Then there is another problem; Starfish. Not just a couple of Starfish, but thousands of them. They are moving along the seabed eating everything in their path, just like a plague of locusts. You can see from this great video filmed by local diver, Colin Garret, just how many Starfish, there are near to the wreck of the landing craft at Ferrybridge. The Starfish will continue to move across the seabed, devouring everything in there path. They are particularly destructive to mussel and scallop beds. The one thing that will stop them is a large storm, This will break up the numbers and those close to the shore are likely to be smashed up and killed in the surf. It looks like we have just such a storm heading our way on Saturday. Hopefully the Starfish will have moved further offshore before then. Chesil Beach forecast: Given that what I have reported earlier, does that mean that our fishing on Chesil is over for the next week or so? No not at all. 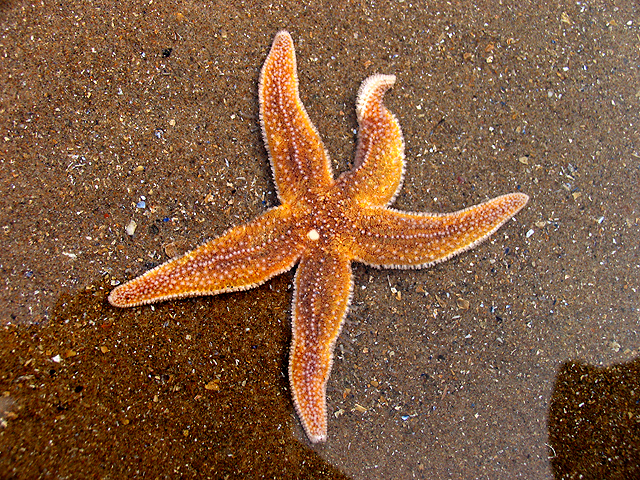 Hopefully the Starfish won’t wipe out everything along the beach and the spring tides are starting to build. Easterly winds will push the baitfish and Mackerel offshore a bit, so you may need to be hitting some distance to pick them up. However that is not so difficult with an easterly wind behind you. The Bream fishing may well be effected though. To the West, Plaice fishing should be OK, with the fish becoming fatter by the week. I spotted a number of Garfish within float fishing range. Dusk will see plenty of Scad very close to the shore. Portland: There was a lot of weed in the water around Portland Bill this morning. That always has a negative effect on the Pollock fishing. Wrasse are happy to feed in these conditions, especially if you use Ragworm. Marks such as Church Ope Cove will have a 1m or more of surf, which is great for Bass fishing. Portland Harbour: I always like to fish Portland Harbour as the spring tides build. The Bass and Pollock feed well, especially as the tide just starts to come in. Expect Garfish, Bass, Pollock, Wrasse and Flounder. There is also a chance of a Gilthead Bream. Sandsfoot Castle sailing club, is a good area to try for them. Weymouth Bay: I had a walk around the harbour on Sunday and I noticed that the normally sedate Mullet were very active. In fact I would go as far as saying they were acting quite aggressively, moving around and chasing each other continuously. Unfortunately, my wife wouldn’t allow me to stop for an hour or o to try and tempt them with a baited Mepp spinner. As usual the piers will produce loads of fish, but they will be busy.